CONGRATULATIONS TO OUR SELECTIVE STUDENTS 2018 - 100% SUCCESS RATE! Well done to our Selective Class of 2018! 100% acceptance into Melbourne High and MacRobertson's: AL, Seddon and EK, Blackburn. At King's Peak Education, we take a different, highly effective approach to preparing for Selective and Scholarship exams. Contact us to find out how to maximise your child's success. Year 7 Scholarship exams in Feb-Mar 2019, Year 9 Selective Exam June 2019 - start preparing now! At King's Peak Education, we know that children learn in many different ways. That's why our small group classes include hands-on activities linked to the Australian Curriculum. 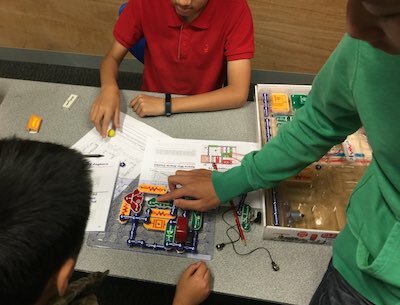 Here are some of our students learning about electronics using our class sets of Snap Electronics Kits. King's Peak Education - tutoring for the 21st Century! Enquire now about our online, home and Saturday classes. Other "tutoring centres" struggle to teach concepts. This is partly because they rely only on textbooks and whiteboards. At King's Peak, we know how important hands-on learning is, so we incorporate a wide variety of teaching aids to help our students learn effectively. Find out about the King's Peak difference today! Scholarship exams for Year 7 entry typically take place in Feb/Mar of your child's Year 6. Start preparing for these very competitive exams now! Subject to demand, we will be offering small group classes in the Eastern and Western suburbs commencing Term 4 (October 2017). Secure a place now and enjoy an earlybird discount! Don't leave preparation too late. Remember, private school fees over 6 years, adjusted for inflation, will cost you over $212,000! Isn't it worth spending less than the cost of a family meal out per week to give your child the best chance of benefitting from a private school education? Call us on 9448 8205 now! Starting Term 1 2017 (start of February), we are pleased to announce our new Saturday campus! We will be using the excellent facilities at the conveniently located Harvester Technical College. 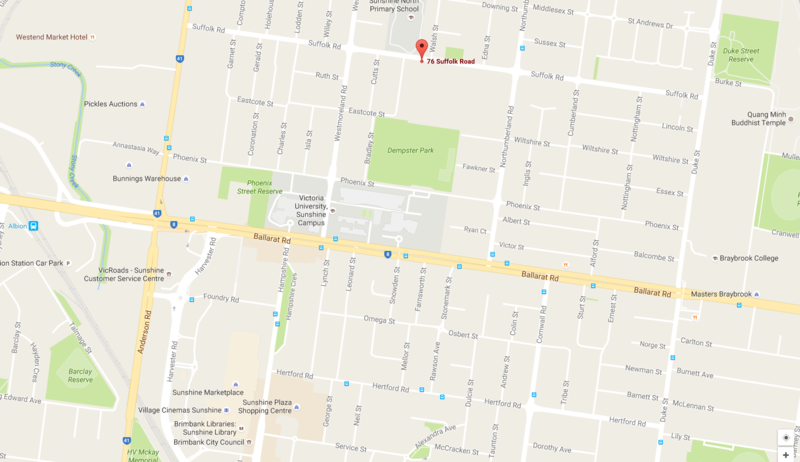 It is right next door to Sunshine North Primary and Sunshine North Secondary Schools. Call us now for early enrolment special offers! Each year, 5000+ students sit for about 1000 places at Melbourne's State Selective Schools. We have been so successful in preparing students for the entrance test, achieving up to 70% success rates, that we are putting our money where our mouth is! Enrol in our Intensive Selective Preparation course and if you fail to get a place at one of the Victorian State Selective Schools (Suzanne Cory, MacRobertson's, Melbourne High or Nossal), you may be eligible for up to 100% refund of Kingspeak Academy fees! 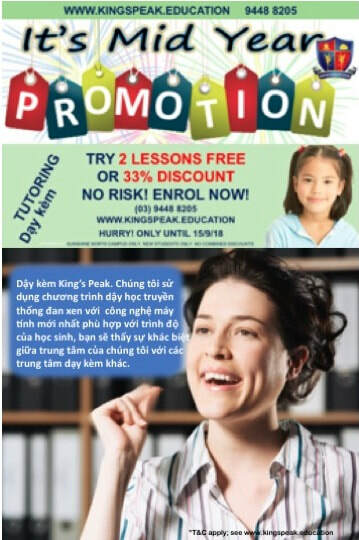 ​See www.kingspeak.education/terms--conditions for full details.